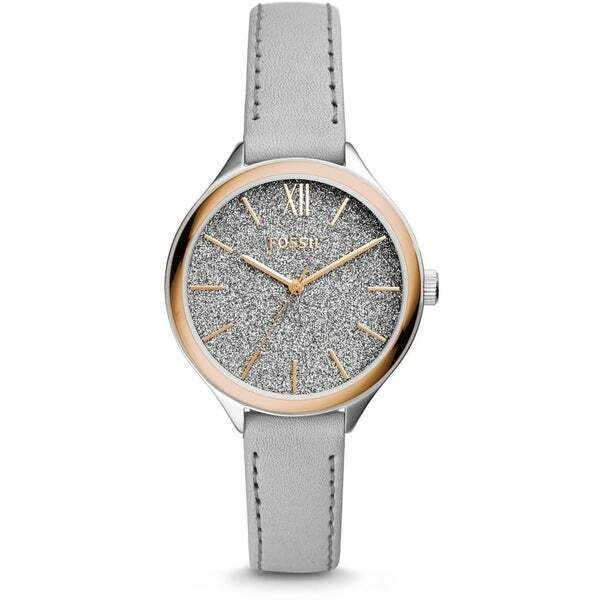 Two-tone (silver and rose gold) stainless steel case with grey leather strap. Fixed bezel. Glitter grey dial with rose gold hands and index hour markers. Roman numeral marks 12 o'clock position. Quartz movement. Mineral crystal. Push/pull crown. Case: diameter 36mm thickness 9mm. Band: width 14mm length 7.5in. Pin buckle. Water resistant up to 50 meters / 165 feet. Functions: hour, minute, second. All measurements are approximate. A Fossil tin box is included.